ScreenSteps allows an author to check out lessons or manuals that another author has checked out. This is useful if the other author is not available to check the lesson or manual back in. Note that besides the method shown here you can also override another author using the contextual menu that appears when clicking on a lesson or manual in a list. When you are viewing a lesson or manual there is a lock in the upper right-hand corner of the display. This tells you if the lesson is checked out by someone. If you click on the lock then a menu appears giving you some options. Select Edit lesson (or manual) if you would like to override the other author and check the lesson out. 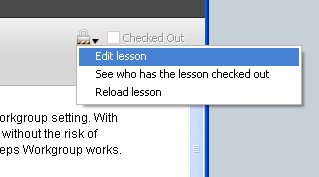 A dialog will appear asking you to confirm that you want to check the lesson or manual out. Click the Edit button to continue. A dialog will appear while ScreenSteps obtains the rights to edit the lesson from the server. After the dialog disappears the interface will be updated with a check next to Checked Out. This means you now have rights to edit the lesson or manual.